“In November of 1929, a seventeen-year-old Scotswoman… boarded the S.S. Transylvania in Glasgow, bound for New York City. With a high arching brow and deep, round eyes, [she] hailed from Tong, a remote fishing community in the parish of Stornoway, in the Outer Hebrides of Scotland" (Mary Pilon, The New Yorker). According to official records, she was a “maid” or “domestic” with $50 to her name, leaving in search of a better life. Thirty years later, a twenty-three-year-old Kenyan man “went to study at the University of Hawaii, Manoa, in Honolulu, where he stood out for his fastidious dressing habits, his forays into public speaking and his fabulous dancing skills.” He arrived “within weeks of Hawaii becoming a state. It's a very exciting time. Hawaiians see themselves as having a whole new future in front of them, just as he does” (Sally Jacobs via NPR). They were two young dreamers from remote villages on opposite ends of the world. Thousands of miles and several decades hence, their respective sons would grow up to be president. Mary Anne MacLeod is the mother of President-elect Donald Trump; Barack Obama Sr. is the father of President Barack Obama. 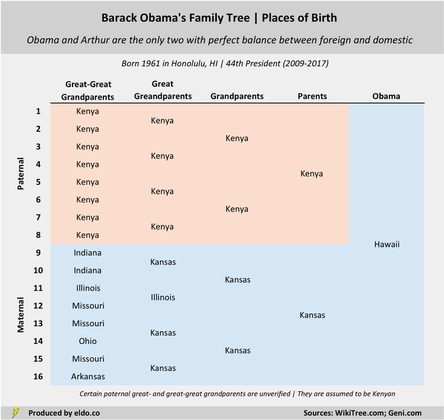 For all of their differences, Donald Trump and Barack Obama share a most fundamental American bond – they are the children of individuals born outside the United States. They are two of only eight presidents who can make that claim. And they are the first such presidents to hold the office consecutively. 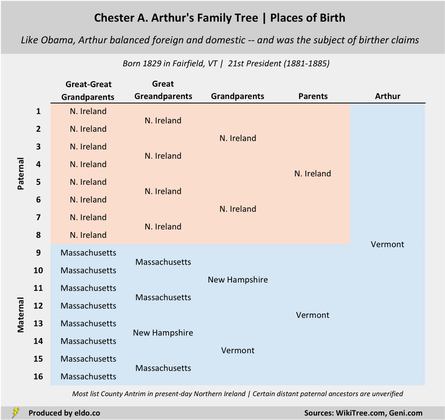 I reviewed the family trees of all 44 American presidents to determine the birthplaces of their parents, grandparents, great-grandparents, and great-great-grandparents - a total of 1,320 family members in all. Andrew Jackson is the only president with fewer American-born ancestors than Donald Trump – ironic, needless to say, given Trump’s loud history of birtherism and anti-immigrant rhetoric. President Jackson was born on the Waxhaw Settlement between North and South Carolina in 1767. His parents (and two older siblings) were born in present-day Northern Ireland, making Old Hickory the only president with two foreign-born parents and zero American-born ancestors. Jackson's Ireland-Carolina roots also broke an England-Virginia-Massachusetts hold on the presidency. Trump’s father – born in Queens, New York to German immigrants – is the president-elect’s only American-born predecessor. In this way, Trump parallels Woodrow Wilson (1913-1921) and James Buchanan (1857-1861). Wilson’s father was born in Ohio to immigrants from present-day Northern Ireland; his mother was born in England. Buchanan’s father was born in Ireland and his mother in Pennsylvania, also to immigrants from present-day Northern Ireland. 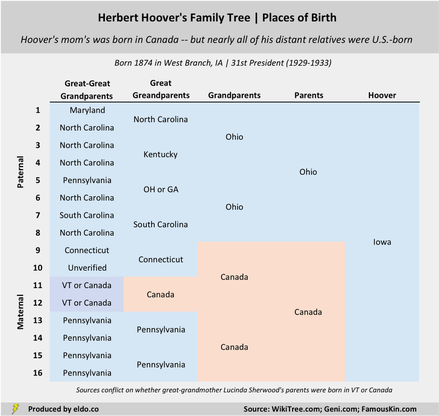 Herbert Hoover (1929-1933) and Thomas Jefferson (1801-1809) each had one foreign-born parent (both mothers), but their lineages otherwise include several American-born generations on both sides, including prior to their mothers’ foreign births. Whereas others came to the U.S. and stayed, Hoover and Jefferson's maternal ancestors moved in and out. Hoover’s had a dalliance with Canada; Jefferson’s moved between England and Virginia. President Obama (2009-2017) and Chester A. Arthur (1881-1885) are genealogical doppelgängers (in a structural sense, not an ancestral country-of-origin sense). Their American-born mothers' roots in the U.S. trace back several generations (unlike Trump, Wilson, and Buchanan, whose U.S.-born parents were the children of immigrants). And their foreign-born fathers' roots lie exclusively overseas (unlike Hoover and Jefferson, whose foreign-born parents had U.S. roots). Every member of this group has two American-born parents, four American-born grandparents, eight American-born great-grandparents, and 16 American-born great-great-grandparents. All seven were born between 1845 and 1924 and were president between 1909 and 1993. Immigration soared in the early and late 20th century, but there was not a hint of it in these presidents. Over 12 million immigrants passed through Ellis Island between 1892 and 1954. An estimated 40 percent of Americans can trace their roots to one of them. But for all of that magnitude, Ellis Island had not produced a president. Until Donald Trump. Their children might grow up to be president. Donald Trump should go take a look. Adjusted for inflation, $50 in 1929 is the equivalent of about $700 in 2016. Based on the fact that she declared her intent to stay in the U.S. permanently (despite Trump's past claims that his parents met while his mother was on vacation). "Opposite ends of the world" is admittedly a little bit of poetic license. The distance from Tong, Scotland to Nyang'oma Kogelo, Kenya is about 7.000 miles. "In 2014, 17.5 million children ages 18 and younger lived with at least one immigrant parent" (25% of U.S. children) per the Migration Policy Institute. With the inauguration of Trump, 44 individuals will have held 45 presidencies. Grover Cleveland was both the 22nd and 24th president. Obama is #44. Trump is #45. Finding the birthplace for 1,320 individuals born as far back as the 1600s was no small feat. Ranges and maximums are shown in the table to reflect any uncertainty. For purposes of this study, "American-born" includes the American colonies. Trump, Wilson, and Buchanan all have one American-born ancestor. A previous version of this article stated that Donald Trump had fewer American-born ancestors than every president except Andrew Jackson. Trump is "tied" with Wilson and Buchanan, so that statement was technically inaccurate. 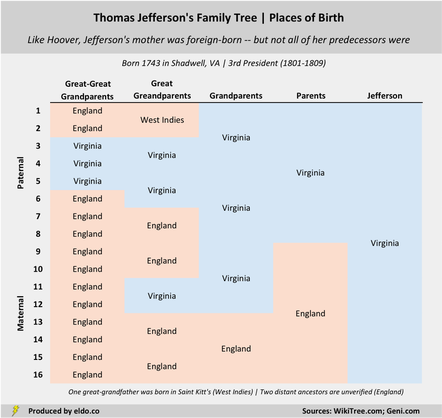 Washington, Jefferson, Madison, and Monroe all had VA-England roots and the Adams father-son duo had MA-England roots. The three observed and verified exceptions to this across all generations studied are a single Maryland-born great-grandmother for Washington, a West Indies-born great-grandfather for Jefferson, and a Scottish great-great-grandfather for Monroe. Wilson's mother's parents were born in Scotland. His father's parents were born in present-day Northern Ireland (Counties Tyrone and Antrim). Buchanan's father's side hails from County Donegal in present-day Ireland. His ﻿mother's side﻿ hails from present-day Northern Ireland. Arthur was James Garfield's vice presidential running mate in 1880. He assumed the presidency when Garfield was assassinated in 1881. ​ Garfield has three unverified great-great-grandparents; Hayes has one. ﻿﻿The main sources for this article are WikiTree.com, Geni.com, and FamousKin.com. Any additional sources used to confirm specific individuals will be added. Data was compiled and analyzed by ELDORADO. All charts and graphics herein were created by ELDORADO.